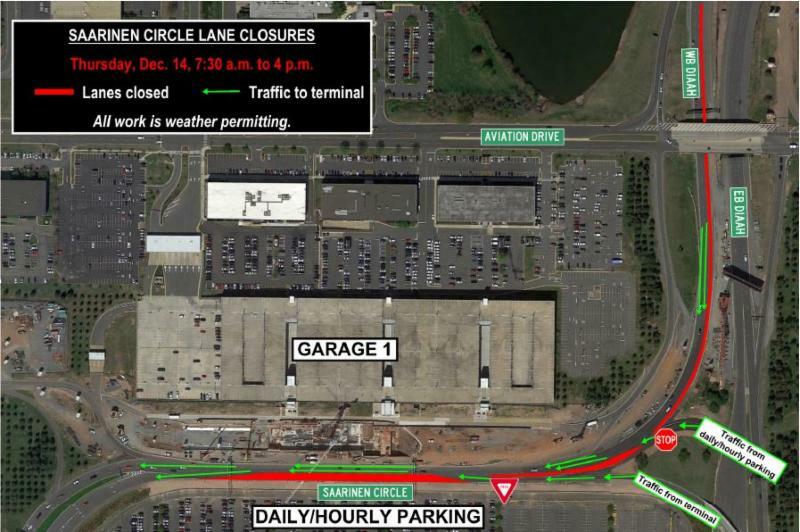 Daytime Lane Closures on the Dulles Airport Access Highway and Saarinen Circle at Dulles Airport Thursday, Dec. 14, 7:30 a.m. to 4 p.m.
Thursday, Dec. 14, 7:30 a.m. to 4 p.m.
On or about Thursday, Dec. 14 from 7:30 a.m. to 4 p.m., a left lane closure will occur on the westbound Dulles International Airport Access Highway (DIAAH) starting near the Aviation Drive overpass and continuing along Saarinen Circle and adjacent ramps. The lane closure will allow Dulles Corridor Metrorail Project crews to repair the pavement in this area. Traffic returning to the terminal from the daily/hourly parking lot will be required to stop before merging onto Saarinen Circle, and traffic exiting the terminal and then returning to the terminal will yield to traffic on Saarinen Circle. See Figure 1 below. Figure 1: A left lane closure will occur on Saarinen Circle and adjacent ramps.